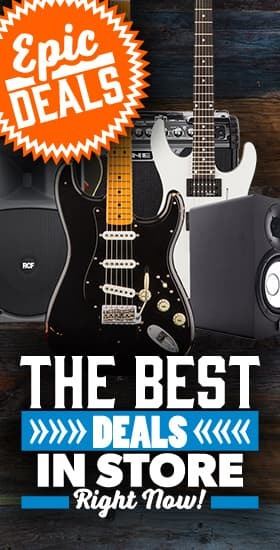 Clearance Bass Guitars & B Stock - Andertons Music Co.
We’re firm believers that every instrument deserves a second chance at Andertons Music Co. Here’s where you’ll find our bass guitar b-stock bargains! What does b-stock actually mean? In our case, it can mean several things. A guitar might have a small scratch in the finish, a synth might be an ex-display model, or a snare might be missing its original packaging. Whatever it is, the items are otherwise good as new and in need of a loving home! Every b-stock item is thoroughly checked by our returns and refurbishment teams to ensure it’s in suitable condition for sale. This is your chance to grab high-quality, as-new gear at a fraction of the standard price! This page is where you’ll find all of your bass-related b-stock. Bass guitars, pedals, amps, accessories – the works. Get in touch if you’ve got any questions – otherwise, happy browsing!